When in doubt about the safety of a particular food, call your vet, or call the ASPCA Poison Control. Note: Just like humans, dogs and cats need a small amount of salt each day to protect them against dehydration and maintain normal bodily functions. Although fresh foods contain natural sodium, they may not contain enough to meet the animal’s daily requirement. 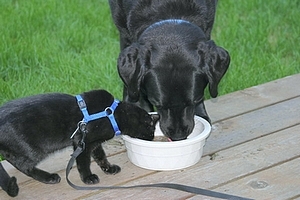 Even commercial pet food companies add salt to their foods. For that reason, I call for salt—either sodium chloride (table salt) or potassium chloride (salt substitute)—in some recipes. Consult your veterinarian if your pet has a special health issue, such as kidney or heart problems, that may mandate a limited salt intake. Potassium chloride provides essential nutrients without the possible challenges of table salt, so if you are uncomfortable feeding table salt, feel free to substitute potassium chloride. If a recipe does not specify a certain form of an ingredient (such as fresh, frozen, or canned), or your market doesn’t carry a specific item, feel free to use whichever form you have on hand. Choose whole foods and fresh ingredients whenever possible, and opt for the low- or no-salt varieties of canned foods. I suggest using organic or all-natural ingredients when you can buy them for a reasonable price. Be careful about offering leftovers from your own meals, which may be too spicy for your pet’s system to handle.